I’ve always been fascinated by an area of music study referred to as reception history. Unlike most musical terms, this one means exactly what you might think, which is simply the chronology of audience attitudes to a particular work, from the premiere to the most recent presentation. Reception histories are rarely uniform, and as such provide something of a barometer for swings of popular taste over time. Many composers come and go into fashion: Bach was viewed as antiquated even before he died, and it took almost a century for his music to be resurrected and appreciated. More fortunate was Mahler, whose symphonies, originally dismissed as Kapellmeistermusik during his lifetime, became an integral part of the mid-20th Century sonic zeitgeist thanks to Leonard Bernstein. Public approbation is a fickle thing, though. Some composers who were very much in vogue at the turn of the last century and were programmed often, like Rubinstein, have been entirely abandoned in the present day. Reception history applies to any kind of work of literature, or visual or performing arts, and in the months intervening since my last entry I’ve had the opportunity to reflect more on Geoff Baker’s highly controversial book, the reactions it continues to provoke from the larger Sistema community, and how those reactions are already shifting. From the regrettable “let’s ignore it and hope it goes away” message from some corners, there has since been an increased willingness to engage with the ideas, even while the tone continues to be deplored. This is a good development. I’m just not sure book suppression is consistent with a movement that has professed values of inquiry, open-mindedness and exploration. My views on the book aren’t changing. I think I gave it a fair review, gave praise where praise was due, and offered criticism where criticism was warranted – at least, in my opinion. (Geoff posted a rebuttal to the review, as he is entitled to do.) What I have done in the intervening months is relate his study to my own experiences in Venezuela, and drawn some surprising conclusions. This is dangerous territory, of course. The problem with referencing “personal experience” as data is that for an organization as broad and diverse as the Fundación in Venezuela, that experience represents a perilously small sample group, and frankly, one that is probably statistically insignificant. My sample group might be a bit broader than most, and I have had the extremely rare opportunity (rare among Sistema commentators, that is) of interacting with a large cross section of the musicians on both a musical and social basis. I work with them and I hang out with them. That said, assuming an overall Sistema population of 400,000 (low), I would still need to interact closely with approximately 2500 musicians in order to be able to make any assertion with 95% confidence, plus or minus 2%. (Naturally the required sample size drops significantly if we’re willing to accept a level of 4%). I’m not even close to that number, and I doubt anyone else is either. No one reads this blog for the math (thankfully) but the point offered for consideration here is that it’s pretty hard to say with certainty that one position, whether it presents Sistema positively or negatively, is true, except in the most broad generalization. But in comparing some of Baker’s assertions with my own experiences, I came to some surprising conclusions. Baker makes much of what he describes as the abusive nature of the pedagogy, the shouting, the negativity, the repetition to which students are subjected. (Particularly fascinating in these instances is how anecdotes held up by other commentators as positive examples of pedagogy are interpreted in a completely different manner by Baker. Why we disagree on what constitutes good teaching is worthy of a blog entry on its own.) But in revisiting just my own recent experiences in Acarigua, I have to acknowledge Baker’s assertions resonated. 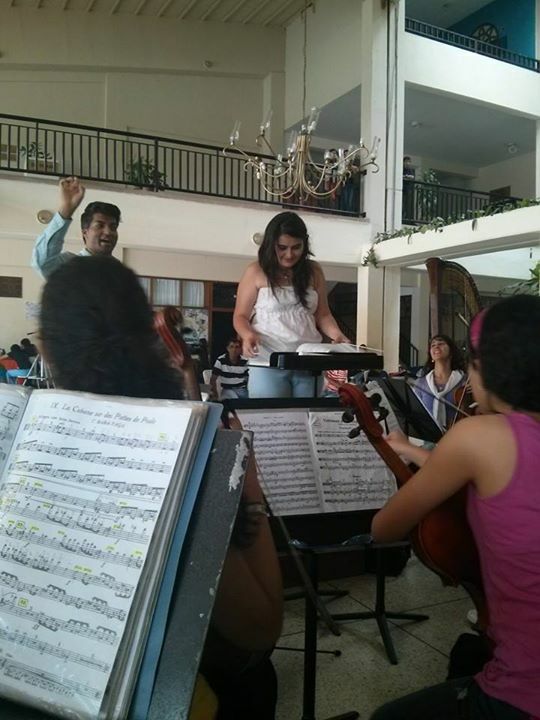 I was generally the last to rehearse the orchestra each day during the seminario, and as such by the time I got to the podium, I usually inherited a group that was completely and utterly demoralized. Smiles were absent. Passages had been drilled relentlessly to the point of monotony. Energy had been expended on microrehearsing details of intonation or technical security – for a performance that would take place in an outdoor basketball court next to a main thoroughfare in tropical heat and humidity. Pictures at an Exhibition is challenging enough at the best of times, but with an orchestra so depressed – so suppressed – some days the work felt impossible. Where my experience diverges with Baker’s is that, with one exception, all the conducting faculty had trained in North America. We imports were the ones abusing, shouting, drilling and – what a surprise – thus encouraging emulation among the Venezuelan faculty. Roberto, consummate host, didn’t want to intervene apart from his frequent reminder to all: “Let them play.” I’ve long since come to the conclusion that bad pedagogy can often leave a far more positive optical impression than good learning, and this experience simply reinforced it. So what did I do? I tried to live by my values, rehearse by my social values and Roberto’s advice, and on two occasions, change things up so the musicians could cut loose just a bit. One afternoon, rehearsing under the gazebo, we simply gave up on a movement and joined the Orquesta Infantil in an impromptu rehearsal of the Venezuelan national anthem, despite the 300 yards intervening between the groups. Even though I was later accused by my expat colleagues of “wasting time” the moment rescued what would have otherwise been a horrid afternoon and made the rest of rehearsal much easier. Good learning, bad optics. The day of the dress rehearsal, I chose to “waste time” again. The concert repertoire had been flogged to death, and I had no intention of contributing to the torture, so I held an impromptu conducting class and opened the podium. That might be a good place to stop, but there are some important trends reflected in that footage. The musicians a) had fun (listen to the laughter!) and b) genuinely supported each other. Other interesting outcomes: c) there were far more male aspirants than female, but I made it my business to give equal opportunity to both genders AND d) although everyone wanted to do “Baba Yaga” only one person managed it at all successfully – a woman. Amazing what happens when you make space for people to try something. Yes, I’m guilty of “wasting time,” but for all those programs touting the immersive nature of the experience they offer, what’s the point of the extra time if we’re not willing to use it differently? A wonderful reminder to those of us who educate. Make a fool out of yourself, laugh occasionally, and “waste” far more time. We are, after all, helping to raise human beings, not business models. One of the necessary goals for each rehearsal: make them smile. Do what it takes. I have been and continue to be a “victim” of “bad optics”.